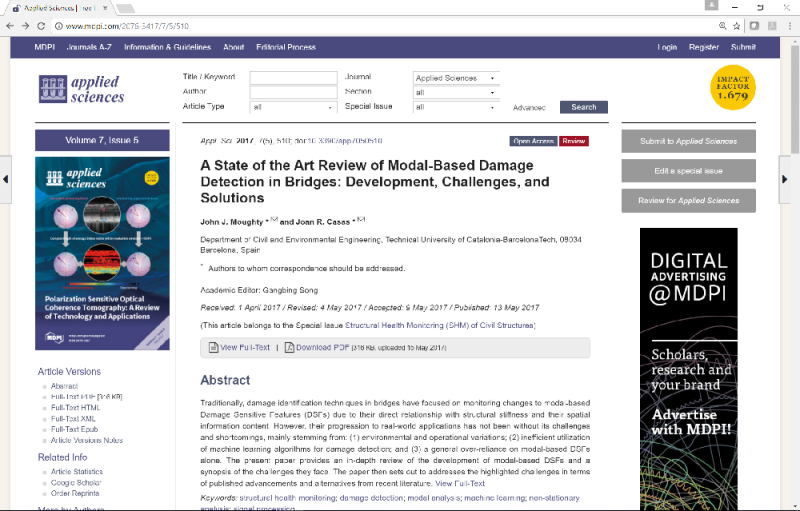 "Review of modal-based damage detection in bridges"
“A State of the Art Review of Modal-Based Damage Detection in Bridges: Development, Challenges, and Solutions” is a paper published by JJ Moughty (ESR10) and his supervisor Joan Ramon Casas, in Applied Sciences on the 13th May 2017. This article was part of the Special Issue on “Structural Health Monitoring (SHM) of Civil Structures” edited by Prof. Dr. Gangbing Song, Prof. Chuji Wang and Dr. Bo Wang. The review by JJ and Joan Ramon covers 172 references. This paper is open access and available for download at the DOI link provided with the full reference below. The abstract, first paragraphs of the Introduction and a link to the full text are provided for info here. Traditionally, damage identification techniques in bridges have focused on monitoring changes to modal-based Damage Sensitive Features (DSFs) due to their direct relationship with structural stiffness and their spatial information content. However, their progression to real-world applications has not been without its challenges and shortcomings, mainly stemming from: (1) environmental and operational variations; (2) inefficient utilization of machine learning algorithms for damage detection; and (3) a general over-reliance on modal-based DSFs alone. The present paper provides an in-depth review of the development of modal-based DSFs and a synopsis of the challenges they face. The paper then sets out to addresses the highlighted challenges in terms of published advancements and alternatives from recent literature. Keywords: structural health monitoring; damage detection; modal analysis; machine learning; non-stationary analysis; signal processing. An aging road and rail infrastructure has initiated and sustained a considerable body of research material over recent decades in the pursuit of enhanced certainty of structural condition and safety. Many bridge structures are now subjected to traffic loading conditions far in advance of their original design criteria. This continual increase in operational condition loading accelerates structural fatigue and reduces service-life; so much so that structural fatigue is no longer a single-structure problem, but a national network issue. Despite the magnitude of academic work on bridge damage detection and identification, the vast majority of in-service bridge data is still collected via visual inspections. These methods are considered to be tried and trusted within the bridge-owner community, but possess several limitations in their scope and attain inconsistent results due to the disparity of inspector competency. International inconsistencies are also prevalent with regards to damage parameter measurement, non-destructive testing methods, condition state definitions, and inspection frequencies, which has resulted in traditional inspection methods being perceived as overly subjective, resulting in recent measures being taken by the international research community to standardise cross-border practices and definitions. Recent figures estimate Europe’s highway bridge count to be circa one million, which would infer that periodic visual inspections alone are not a practical option, and this has led to many bridge-owners calling for increased integration of monitoring techniques with standard inspections.